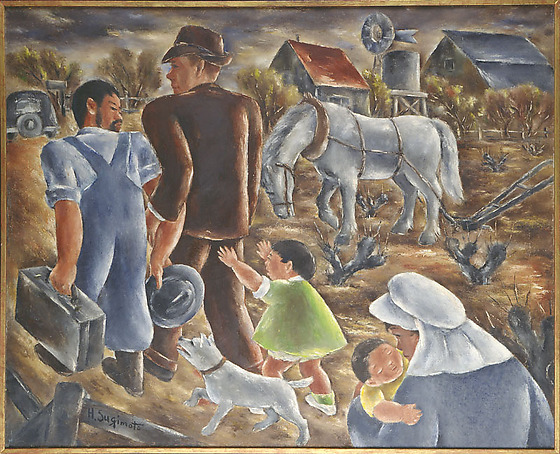 A man is taken away from the familiy farm by an FBI agent as his young family watches. Backs to the viewer, a bearded man in blue shirt and overalls carries a black suitcase in left hand and black hat in other as he is led away by the arm to a waiting car by a tall man in a brown suit and hat at left. He looks over his right shoulder at a young girl in a green dress with white trim who follows with outstretched arms. A white dog walks at her side. In right foreground, a woman in a white bonnet and greyish blue dress holds a child in yellow. Part of a fence is visible in left foreground. 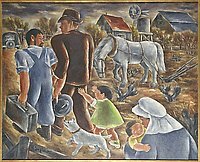 In right background, a white horse stands with head down harnessed to a plow. Black cactus appear in the bare field. A fence and other farm buildings, including a water tank and windmill stand in the distance, right, while a black car waits next to a mailbox in left background. Sky is dark and gloomy.